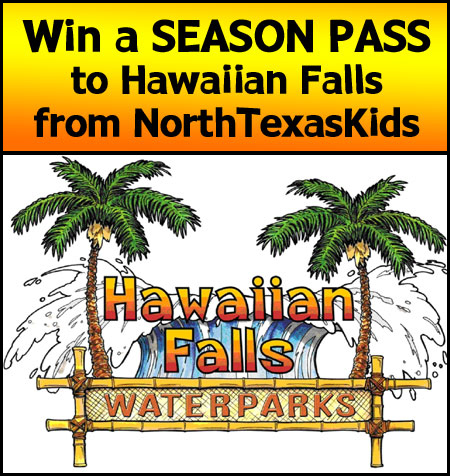 Win a Season Pass to Hawaiian Falls! Would you like to Win a SEASON PASS to Hawaiian Falls? Contest ends on Tuesday, May 21st at midnight CST. Winners will be notified by email (the one you use to leave the comment below) and must respond ASAP! I would love to take my grandchildren to Hawaiian Falls for the summer. Please choose me. Thank you. I don’t know how to get the ULR # to come up. Love NTK & Hawaiian Falls! We would LOVE to have a season pass to Hawaiian Falls. I already Liked NTK a long time ago and I did post this contest on my Facebook page. However, I am not sure I am posting the correct link back to it. I hope that doesn’t disqualify me . . .
Congratulations to Jaime K – she is the winner of the Season Pass! Keep tabs on the NTK weekly enews, more ticket giveaways to come!